Can this be done from scratch in Sync? I have bashing Sync for a long time but am considering it if I can get past a few hurdles. Attached is a sheet metal design I created in ordered. My question is this. Can this be created from scratch using only Sync? I don't believe so, becasue I use the unbend-rebend workflow. The design is only 3 pieces of sheet metal. and here are my modeling/drafting requirements. The overall size and gage can be edited without changing the design intent. The flat pattern and bending tables for each part. The bend tables must include back gage and stick out for each bend. And this is why I want to use Sync. I want to imbead the bend table math into each part so that I can grab parts and use them in other models with the bend math included with the part. The main problem is cuts ending in the plastic zone that need to be dialed in from the flat then checked looking at relations between multiple parts. Model notes: Moving the planes in the model resize the sheetmetal design. Re: Can this be done from scratch in Sync? Why couldn't you get it to only use Ø.261 holes in the corners? I'm sorry I really shouldn't even be involved here because I only use ordered for the most part and would be the last person who would know how to use syncronous to create an assembly driven reusable assembly. But I could probably give you some better ways to do this in ordered though. The flat pattern/feature fails is the hole is smaller. Any ways to improve would be welcome. The part looks simple, in reality is very difficult. Sorry, I've been insanely busy. Just a question, I noticed that at the joint between the main box and the lid you've used rectangular cutouts. Is there a reason you don't use slots? And since you're doing them as a cutout instead of a slot, have you thought about, instead of using an actualy rectangle in the way you have, doing a symmetric offset instead? Then you could just draw in a line and place it where needed then use symmetric offset to get the rectangular cutout like you have. I haven't had the time to really look into this as of yet, that's just one thing that I saw when I was in there that I was wondering about. The slot command, though I hate that you can't place more than one at a time, and I also hate that it only allows you to do slots center to center instead of total length obrounds, but aside from that I love the slot command because you can mate to them slot axis to slot axis or slot axis to hole axis which is great, and you can also have the callout on the print linked to the slot size, you can even have it call it out as overall length slot or center to center, which is puzzling as it won't allow you to create it as overall length but can still have it read out that way on the draft. I only spent a short time on this. In some cases I'm sure because I didn't understant why you did some things perhaps I didn't do what you were needing. Most of the changes I've done here are on the lid piece. I changed the way it's built, I left that final bend in though because I didn't have time but I would like to understand why you used a bend there instead of a contour flange. I changed what used to be flanges on three sides + close corner and changed them to a single contour flange feature + a tab. Also changed the rectangular cutouts to a slot, and also left in the driving sketch a symmetric offset rectangle instead of the original rectangle, but like I said I used slot instead of a cutout to make that feature anyways. I Because I was working on the fly and didn't want to try to remember what was there earlier I have some extra sketches going on, but I believe I could build this using considerably less features than I have here. The only parts other parts I did any changes on was the B1 model, in which really all I did there you can see if you open the varaible table and see that I used earlier feature dimensions to drive one's with the same dims so if you change flange length from .75" to 1" hopefully all the flanges and related cutouts will change accordingly. You just have to make sure and change the driving one to accomplish. Like I said I didn't have that much time to spend, and this is just closer to how I would model these parts. Really I would have a different method to construct the assembly, I prefer to have a driving base part that controls most of this stuff rather than assembly planes. Though if I was going to drive from the assembly planes I personally would be driving their locations base of a sketch. Just a thought. Why first a sketch of a triangle and than a cutout? Why not just a cutout with one line? @12GAGErelies on rebuilds going to plan when he creates new models and resizes them so I can understand using a closed section within its own sketch as it is much more robust than an open section (line). There is never ambiguity over which side material is to be removed. I'm not trying to change the design at all. I'm trying to figure out if the relation between the flat pattern and finished shape can be accomplished exactly the same using Sync only design from scratch. I don't think it can, but I would like anybody to prove me wrong. This kind of sheet metal problem is representative of my problem with Sync in general. I have similar issues with about half of my models. I want the cut in the finished part to be exactly 45 deg. This is not the case w/ the side angles of flanges in the plastic zone. Why: We use a punch and the part has to be drafted. And I will no longer be able to "cheat" with drafting comments soon. I want automatic nesting exports for fabrication. 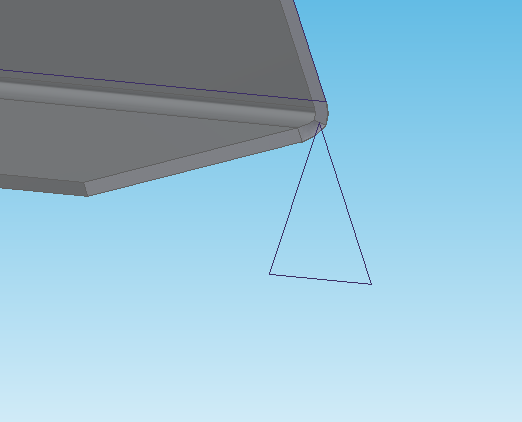 However, I am forced to create flanges w/ side angles to get holes in the 3 way corners. I avoid contour flanges when I can. The location and amount of the non-90 bend on the lid is the last part of the design that is not determined until I look at the lid in the open position past 90 deg open. This is why there is an extra copy of the lid in the assembly. A rubber molding is used to keep the lid from scratching up the filter pan when open. Also worth note, this design is welded on top of salvage oil tanks as a place to drain oil filters. The other tank has a place for this to drain into. to Nominis38: Thank you for giving this a look. I looked at the model you uploaded, it fell appart. stability of the result after resizing is a requirement. Also, I put the cut and tab sketches all together because I have to edit in the flat, then check the results bent. it typicaly takes me about 3 cycles of editing those dimension to get the desired results for welding gaps and bending springback gaps. I wanted a single location to do all of that editing. The tab command for instance does not allow you to select an existing sketch. So I created the sketches, then trace that when doing the tab command. This is why you are not using the slot feature. Slots are not a good feature. This seems to be a useful cutout function. One task at a time is a feature that does not really fit. Can it be modified to be multiple sketches?